A coiled piece of steel wire, sharpened at one end with a catch plate at the other, the modern safety pin is a device that can be traced back to New York City in about 1825. An indebted inventor named Walter Hunt sought a way to repay a $15 debt. He designed a "safe pin" for securing clothing, which protected fingers from the sharp end. He patented the design in 1849 and sold his idea for $400. The design has remained virtually the same ever since. However, the manufacture of its most common material, steel, has greatly improved, as has the mechanized process used in forming the pins. In 1864, E.J. Manville invented an automatic fourslide machine, which was the forerunner of machines used today. Even though the current design is a modern one, the safety pin is an ancient fastener. Coiled bronze pins, embellished with gold and several inches long, have been found in Egyptian tombs. The Greeks and Romans called them fibulae (Latin for brooch) and used some to fasten garments, while others were mainly omnamental. Dating from the seventh century B.C. , elaborately decorated fibulae often had rows of lions or sphinxes along the catch plate, either carved in relief or soldered. An Iranian pin from this period was shaped like a human hand and embellished with two lions placed head to tail, while an Etruscan fibula from the eighth century was decorated with ducks. The fibula became widely used throughout the ancient world as the Roman Empire expanded. In the Middle Ages, the design reverted to one resembling a straight pin. These were fashioned out of skewers of wood for common people, or out of bone, ivory, silver, gold, or brass for those of wealth and high position. In the 15th century, pins were manufactured from drawn wire, a process that still exists in the manufacture of modern safety pins. Today the largest user of safety pins is the retail sewing notions market, while the largest commercial user is the laundry and cleaning industry. The most common metals used in safety pins are spring steel, brass, and stainless steel. Most fasteners without critical strength requirements are made from spring steel, an alloy of iron that has a high carbon content (more than 0.5%). By varying the proportion of carbon added to iron, spring steel can have high tensile strength and resiliency that allows it to flex and return to its original shape. Brass is an alloy of approximately two-thirds copper and one-third zinc. More expensive than spring steel, this metal will polish up to a high luster. It is nonmagnetic and easily worked into shape. The strength of brass is adequate for most safety pin applications. More expensive than brass, stainless steel is an alloy that includes chromium and nickel (manganese is sometimes used instead of nickel). With a mirror-like finish, stainless steel is used when corrosion, temperature, and strength are considerations. However, for some safety pin applications, a type of low-carbon stainless steel—ferritic, which costs less than stainless steel—is used. finish on spring-steel pins is chrome, followed by a final wax coat. If the pin is to be subjected to damp environments or to a piece of cloth for a long period of time, other treatments are used to prevent stains from corrosion of the steel. One of these methods is to coat the pin with the chemical chromate, particularly on spring-steel safety pins. For brass safety pins, nickel coatings are used, as they resist some chemicals and remain attractive for a long period. A more expensive treatment for brass pins, primarily for decorative purposes, is gilting. By tumbling the pins in an acid bath, the top layer of brass is removed, revealing a shiny, goldlike surface. The modern manufacture of safety pins is completely automatic. Specialized machines have been developed to perform multiple steps, replacing many workers and increasing the efficiency of the manufacturing process. Over 3 million safety pins can be made by one factory in a day, almost 1 billion a year. There are only two U.S. companies that make safety pins, although there are many more companies abroad. form the mass into a bar called a billet. It is then pickled in acid to remove oxide scale, passed through rollers, heat treated, and then cooled slowly, a process known as annealing. The cold metal is then shaped into wire by drawing it through several dies of decreasing size. During this stage, the metal undergoes frequent annealing to prevent brittleness. As it passes through increasingly narrower dies, the wire achieves the correct gauge (thickness). 2 At the pin factory, coils of high carbon spring-steel wire are loaded onto spools and fed into the roll straightener. This machine straightens and cuts the wire to the correct length, from an inch up to a foot long. 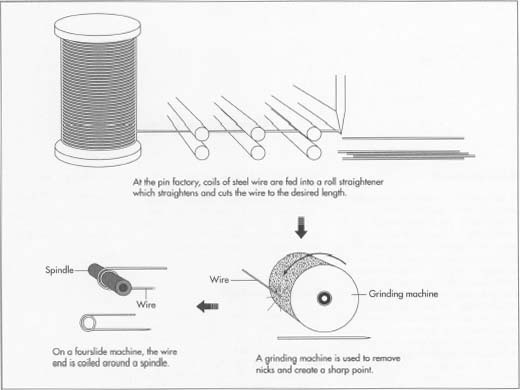 Most cutting machines can be adjusted to accommodate various diameters of wire. 3 The cut wire pieces are carried by conveyors or by cart to the grinding machines. The wire pieces are hopper-fed and pressed against grinding wheels. One end of the wire is ground to a point. It is also in the grinder that the metal pieces are polished and nicks and burrs removed from the tapered edges. 4 The forming process is done by a fourslide machine, which allows for a range of motions in four directions. The machine is custom tooled to form the safety pin. The wire pins are hopper-fed into the machine, where they are picked up on a chain. They are then coiled around an arbor, or spindle. The unsharpened end is bent into a hook that will hold the cap. 5 Meanwhile, steel sheets are fed into the machine from the other side. 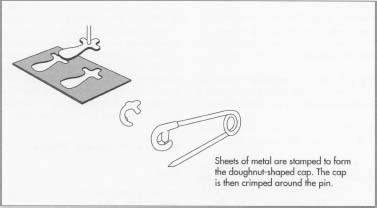 The sheets of metal are stamped on a die, producing oddly-shaped pieces that will form the doughnut-shaped cap. 6 A stamping operation forms the two-dimensional die-cut steel pieces into three-dimensional caps. 7 Inside the machine, the sharpened, hooked, and coiled wire meets up with the cap. The cap is then crimped around the hooked end of the wire. At this point, the safety pin is fully formed and the clasp is closed. 8 For those users who purchase the safety pins with the point open and ready to use, the cost is higher. A mechanical device at the end of the chains opens the pins, and finishing must be done in smaller batches, as the pins nest and tangle together. 9 The pins are loaded into perforated plastic baskets. If plating is required, steel pins are generally chromed, while brass pins are nickel plated. In electroplating, the formed pins are placed into a tank of the coating solution. The tank is electrically charged, forcing the chemicals in the solution to adhere to the pins in a fme layer. The electroplated pins are shaken by the rotating tank to ensure an even coating. 10 The pins are rinsed off with water and then placed in another tank, where a chemical bath gives them their final polish. 11 The pins are washed in a detergent solution and given a wax finish. 12 The formed and finished pins are then packaged. Lots of 10 gross per box is the standard bulk, or industrial pack. Most consumers purchase safety pins in retail polybags or blister packs. Although more modern fasteners like velcro have been introduced in the 20th century, they have not replaced the safety pin. Its simplicity and usefulness seem to guarantee its future into the next century. There is still a large market for safety pins in the less industrialized nations. In India, for example, pins and sewing needles are kept and used for generations, passed on from mother to daughter. In an economy such as this, people do not have easy access to alternative fasteners, and great value is placed on what many of us perceive as a commodity item. Petroski, Henry. The Evolution of Useful Things. Knopf, 1993. Fastening, Joining & Assembly Reference Issue. Machine Design, November 13, 1986.